My friend Brenda Sieglitz is pretty doggone amazing. She works, she writes, she grieves, she marries, she conquers. Today, she honors me with her presence in the Writers Write interview series. Please enjoy her interview and then check out the bottom of the page for a little challenge I’m offering for you to help Brenda. 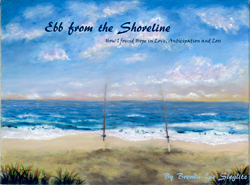 I launched my Kickstarter campaign on September 29th to fund my love and loss memoir, Ebb from the Shoreline – How I Found Hope in Love, Anticipation, and Loss. This story covers 3.5 years of my life from when I met my first husband online until the day that he lost his life to a rare cancer, Angiosarcoma. Readers will flow back and forth in my memory bank from the first time we met at the local airport, to c amping trips, then onto the blogs that I began writing when Kevin first became sick. You will learn about long distance relationships, U.S. immigration, difficult moves, our wedding, being broke and in love, finally finding a bit of success, surf fishing in the Atlantic, and then ultimately Angiosarcoma, stupid cancer, and death. I need $5,500 to fully fund my Kickstarter project, and these funds will pay for final editing (courtesy of the AWESOME Andilit! ), publishing, printing, and marketing. Each backer will get to choose from some awesome rewards depending upon how much they want to and are able contribute. There will be postcards and prints of an original artwork “Fleeting Moment” that was created by Kristi Connelly exclusively for my book cover. There are digital and print copies of the book, private author sessions, book readings, launch party invites, tributes in the beginning of the book as well as surf fishing lessons. I’ve been working on this project for nearly 5 years, and I’m excited and terribly nervous to finally set it free to the world. I don’t ever remember a time in my childhood when I didn’t have a book in hand. I adored the Berenstein Bears when I was very little, then progressed into traditional authors like Laura Ingalls Wilder and Ann M. Martin. I’ll be honest-once heavy reading became required in high school, I read Cliff Notes (I don’t recommend; they never gave me As.). Yes, I’ve admitted it! I still don’t like required reading, which is why I should never join a book club. I would never call myself a well-read person and often find myself embarrassed at not having read the classics. However, I absolutely love soaking myself into the words of an entertaining and thought provoking book. Books have given me an amazing imagination and the ability to dream outside of the box. Now or then? Then, several times a week, to once a week, and now it’s completely sporadic. I’m very fortunate to have a full-time job that engages me and that I really love. It’s taken a lot of time and energy out of me, however, so since I took this job, the frequency of my writing has really suffered. I’ll be laying out a schedule for November and December to plow through the rest of the memoir rewrites that still need to be edited, which means I will probably be avoiding all social media and blogging. Maybe. It’s going to be very labor-intensive, but well worth it. I know that I need to complete this project before I can look ahead . . . although I have a pretty good idea of another book idea (a collection of thoughts, inspirations, and “Please don’t repeat my mistakes” advice for widows). I stopped reading several weeks ago (in an attempt to work on my own writing – ha!) when I finished my 8th Nevada Barr book since April. Typing that out is slightly humiliating. I love entertaining books, and I love National Parks, so that’s how I was able to read 8 of her books in a row. Of course, now that I see that book #9 is about Montana, I won’t be surprised if that gets snuck in sometime between now and the end of the year! I also read my friend Susan’s book, Gold in the Days of Summer, which was a really lovely, quick read. A Walk in the Woods – Bill Bryson. Bryson is controversial, but he provided me with some amazing history on nature and the earth that I found astounding. I read this book right before I went camping with my now-hubby at Worthington State Forest in NJ, which is in the Delaware Water Gap and near the Appalachian Trail. It was amazing to be in a place that he had written about. It’s probably why that park is still my favorite place to camp in the U.S…so far. National Parks – America’s Best Idea – Dayton Duncan and Ken Burns. I loved the Ken Burns documentary on this – it was breathtaking, heart wrenching, awe inspiring to watch. I still catch it on Netflix when I’m craving nature and can’t get outside. I’m just so proud of this system that we have created and managed to preserve thus far. I volunteer in the parks, so the NPS is extremely important to my day to day life, and I truly believe it is one of the only good things left in our government system, but that’s for another discussion, another day. The Last Season – Eric Blehm. Ok, you can see my theme now, right? This was an amazing story about a park ranger who went missing – a man who knew those woods and those hikes like he knew himself. But that’s kind of the twist, I guess. It’s a really interesting story, lots of twists. I can’t say these are all my “all time favorite” books because, frankly, I don’t write down the titles I read and I have a pretty lame memory. However, these are some really great reads that I recommend if you love nature. Which I do! I love connecting with others on social media – Twitter was one of the tools that helped me to survive after Kevin died. I simply shared my thoughts as I was grieving and found a following there. Those thoughts then expanded into daily blogs. It didn’t feel like writing to me; I was sharing my grief with the world so I wouldn’t feel so alone. I focused more on the writing itself when I secured my first travel writing gig with Visit Pennsylvania. That developed into more leads and eventually I found myself winning a writing award for an opinion piece and landing a really awesome year-long travel writing opportunity. There was never a plan; I just did. I shared my heart, and from that, I found a gift I had wanted since I was a teenager – to be a journalist! I wake (barely), get ready, and head into my full time job–there I connect with travel-related businesses all over Pennsylvania to help promote them in our quarterly travel guide. In the evening, I enjoy watching TV and relaxing with hubby and puppy, and then, I began scheduling my social media to promote the Kickstarter campaign. This helps keep me on track and to be able to create unique posts throughout the day rather than the same message every time. Depending upon where my head is, I’ll pound out a blog, which these days is more or less just a venting session of what’s going on in my life. A month from now, this schedule will hopefully look VERY different! Large window overlooking a wooded scene with a flowing stream or pond…or lake. Autumn temperatures year round, muk luks on my feet, coffee by my side, indie music in the background. I wrote a negative review of an attraction in Northeastern Pennsylvania. The owner came back at me asking why I didn’t speak with her first before publishing the review. I explained that it was a review, and to be fair to the readers of my article and visitors of the area, I felt it best to be honest with them about how the attraction was to an average visitor. She was not happy, and I felt as if I had done something wrong. I approached the agency who sent me on the trip, and they appreciated my honesty and encouraged me that I had done the right thing. Too much of a plan will hold you back. Goals are important, but heart is more so. You need heart to connect with readers on the levels they desire to be reached. Skimming along the surface will not cut it anymore. Go deep in your soul and pull out strong thoughts and words; then find the right people to encourage you to share those words with the world. Brenda Lee Sieglitz is a hobby writer who resides in Mount Joy, Pa with her husband Dave and her redbone coonhound Molly. She has a deep love for all things travel, National Parks, scamping, nature, hiking, and helping those in the grief and cancer communities.